Lissette Szwydky and Marie Léger-St-Jean are seeking papers to round out a panel entitled “Adapted Materials” that includes presentations on theatrical adaptations and serial novels sold in penny numbers. 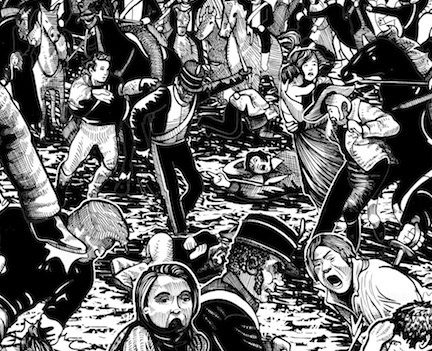 We wish to convey a historical understanding of adaptation in its numerous forms —including illustration— as a popular and profitable cultural practice. We will submit the panel to the Nineteenth-Century Studies Association’s conference in Boston, March 26-28, 2015. Missed the deadline or can’t make it? We’d still like to hear from all those studying the emergence of a global mass multimedia culture in the form of entertainment industries led by commercial interests, so please get in touch! RIN member Mathew Crowther asks me to alert network members to the fact that he has created a small digital archive of material which is freely available via his wonderful blog, https://theprintshopwindow.wordpress.com. 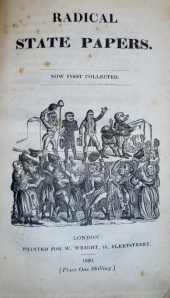 It contains copies of the illustrated portions of some of the rarer satirical pamphlets in his collection which were published during the Queen Caroline affair of 1820-1. A number of these items are not even listed on COPAC, so it is very likely that this is the only online archive of such material. ‘Hello, I’m Michael Demson, and I am an assistant professor of English at Sam Houston State University in Huntsville, Texas, where I teach undergraduate and graduate courses in Romanticism, World literature, and literary theory. Currently, I am working on a book-length study on transatlantic radicalism, agrarian politics, and Romantic literature, a project supported by an American Council of Learned Societies’ Fellowship for 2014-2015. 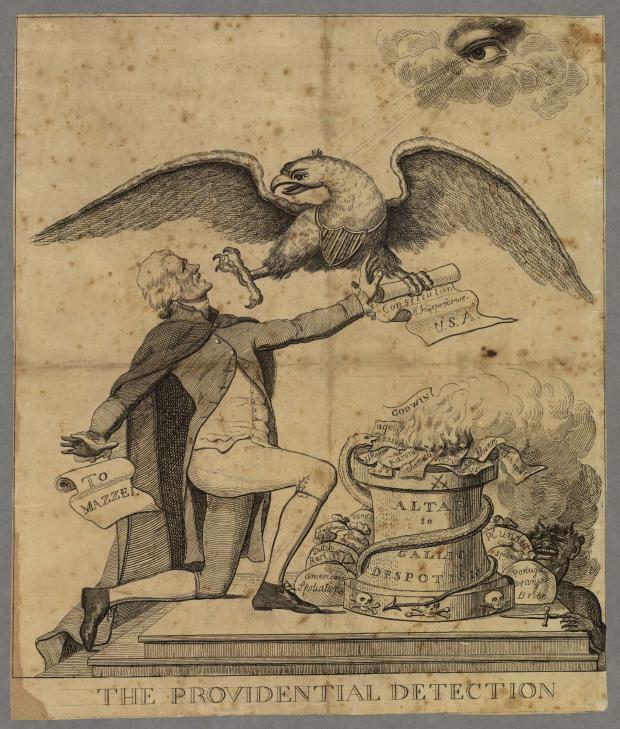 The first few chapters of this book will explore critiques of agricultural improvement in literary, philosophical, and political correspondences during the 1790s between such figures as Thomas Jefferson, Constantin-François Volney, and William Godwin (a transatlantic network of radicals that this anonymous 1798 cartoon sought to expose, figure 1.). The subsequent chapters explore later Romantic novels (Cooper, Hugo, Trollope) profoundly affected by the radical critique of improvement developed during the decade of revolutions. We are delighted to announce that the next symposium of the Romantic Illustration Network, on Saturday 29th November 2014 at the Institute of English Studies, Senate House, University of London, will be supported by the British Association for Victorian Studies (BAVS): http://www.bavsuk.org. It was clear from our first symposium in June (see an earlier post for the event report) that much important work on book illustration has been done within Victorian studies, and part of RIN’s role will be to establish fruitful dialogue between researchers working across the eighteenth and nineteenth-centuries. Further details for November’s event will be announced soon via this blog.